The Association of Far Western District Champions is comprised of the members of the 61 quartets that have won the FWD Quartet Championship. Their distinctive black badges identify them as part of an elite fraternity that adds a maximum of 4 members per year. Over the years there have been Three traveling Trophys that the quartet gets to have for the duration of their Championship year. The trophy is passed to the new championship quartet at the District contest. The quartet also recieves a smaller version of the traveling trophy that they get to keep forever. There have been three versions of the traveling trophy. The only difference between Version 1 and Version 2 are the men on either side of the pillars and the woman in the middle. 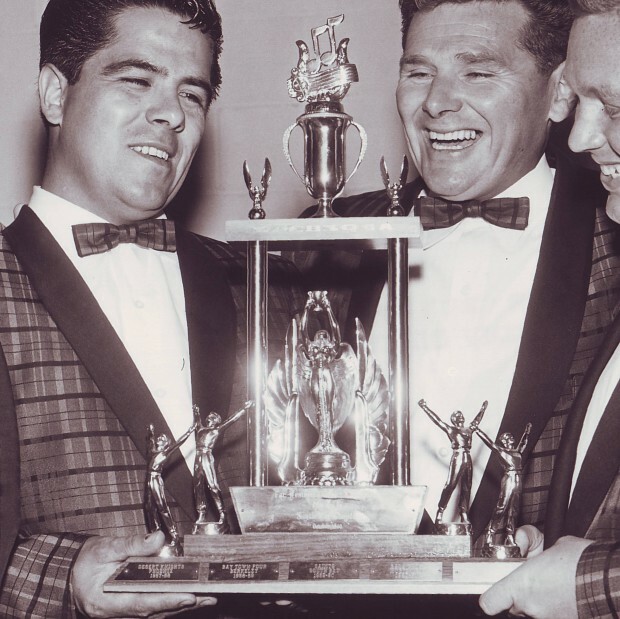 Acording to Lou Velzy (early days of FWD awards chairman) the 1st trophy was probably lost when Version 2 was brought into play, which almost happend again to version 2 when Version 3 was created, Dan Jordan saved Version 2 from being left behind when Special Request won the title. Version 3 (the current trophy) designed by Dan Jordan in 1983 and crafted by fellow champ Jim Arnold, member of the Crown City Four 1955 FWD Champs and owner of Arnold's jewelry (Pasadena) and father-in-law to Kevin Smith, bass of the Occidentals, 1977 FWD Champs. Dan picked up the trophy and travel box in his 1969 MG Midget and drove it tied to my trunk lid from Lake Avenue in Pasadena to the Pasadena Civic Auditorium, about 8 blocks away. The concept was to have all pertinent information on each quartet plate. 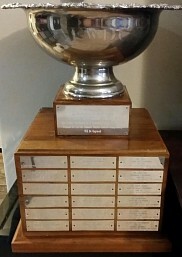 The Version 3 trophy was purchased from money raised through the Late Show. 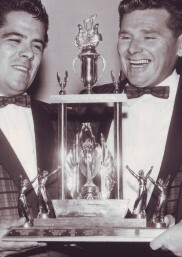 The miniature individual trophies match the big trophy and were originally supplied by A&A Golden West Trophy of Glendale. Friday night of the FWD fall convention is the time when the champion quartets of the past are invited to “strut their stuff”. Some sing only a one-song cameo while the current, active quartets will sing a full set. The show traditionally closes with our current champs singing their “swan song”. Sponsored by the (non-existent) Blythe Chapter, this chorus of AFWDC members sings during the tabulation of scores at the end of the FWD district chorus contest. These grown men go back stage and rehearse for 10 minutes, and then come out and present the two weirdest and craziest songs of the contest. Some unbalanced folks have said the “Scorps” are the highlight of the chorus contest ! Each year, about 2 weeks before the international barbershop convention, the AFWDC sponsors a show to raise funds for the quartets on their way to competition. In the last 10 years the FWD has sent more quartets to International than any other district ! There are a large number of photos on this site. Every effort has been taken to locate the photographer for each photo, however a great number of them are unknown. If we know who took the photo, we will put a "Photo By:" line next to that photo giving proper credit. If you happen to know who took the photo, please forward that information to the webmaster so that proper credit can be given. We apologize for the gaps in our information. Note: there are a number of photos from the collection of Dan Jordan. We thank Dan for the use of his collection of photos but also seek the photographer for those so that proper credit can be given. Thank you- AFWDC Board.